Stereotypical Stephen King novels are long, super-scary, and also very long. 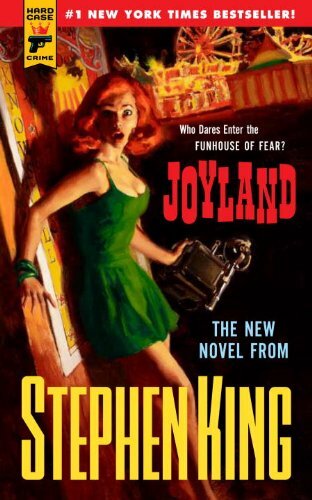 Joyland is in some ways a bit of a departure for King, in that it's less than 300 pages and heavier on romance than chills. It feels weird to say this, but this book is...sweet. In the paperback copy I borrowed from the library, the sections breaks are noted with tiny hearts (not a joke). Devin Jones is a college student who takes a summer job at an amusement park in North Carolina on a whim. His girlfriend is sending strong signals that their relationship is on the wane, but Devin steadfastly ignores them, making plans for her to visit from Boston, where she will be working for the summer. Of course, she never makes it down. Somehow, Devin is devoted enough to manage lovesickness even with all the exciting distractions around him. At Joyland, he learns to do basically everything, from running the Ferris wheel (dubbed the Carolina Spin) to dressing up in “the fur” as Howie the Happy Hound. Beneath the peppy music and colorful booths, however, Joyland hides some sinister secrets. Devin hears rumors about a ghost of a young woman who has haunted the Horror House since she was murdered there, during the ride, by a man who's never been caught. The mystery begins to draw him in, and Devin is determined to find the killer and bring him to justice. In the meantime, he just might find a new lady love as well. Overall, this is an enjoyable read, though compared to other works of King's, it reads a little like a side project. If you don't have the time or inclination to sit down with one of his heftier tomes, this is a light and sweet read that will give you the flavor of King without all the blood and gore. Bottom line: Read this book, and enjoy a sweet and simple diversion.